Delivering everything from neck-breakers and 4x4 shimmies to brolic breakbeats, the venerable Vinja is a stalwart of turntablism and high-octane electronic grooves. Vince Santora (Vinja) picked up the decks for the first time back in 1998. So began a journey that would lead not to widespread acclaim, but to Vince setting down the project after several years of extensive gigs throughout the US. Come the turn of the 2010s, Vinja had put skin back in the game and caught the attention of Envisioned Arts. AFter partnering with EA, the Vinja project was reinvigorated and pointed towards new territories and audiences. This summer, Vinja performed in Tennessee at the upstart gathering Solasta Festival, itself co-produced by Envisioned Arts. During the course of the weekend, we were able to steal Vince from the revelry for candid conversation covering the development of his tunes, Solasta itself, and the ever-evolving music social phenomena and his place within it. Considering that he was tapped to host a workshop on vinyl scratch earlier that afternoon at Solasta, Vince has without question stepped forcefully into that dynamic. Years of intimacy with waxy vinyl has granted Vince an indelible skill that sets him several cuts above the competition. To get a better feel for Vince’s vinyl skills, check out Rusted Rhythms 23, a new mix from Sortof Vague featuring cuts and scratches from Vinja. As our time together came to a close, I asked him about his thoughts on Solasta Festival. He’s been on board with this event since its infancy, having performed there last year, and he was anything but coy about his adoration. “So Solasta this year looks like it has just quadrupled in size! Last year it was really just a bunch of producers partying out here. 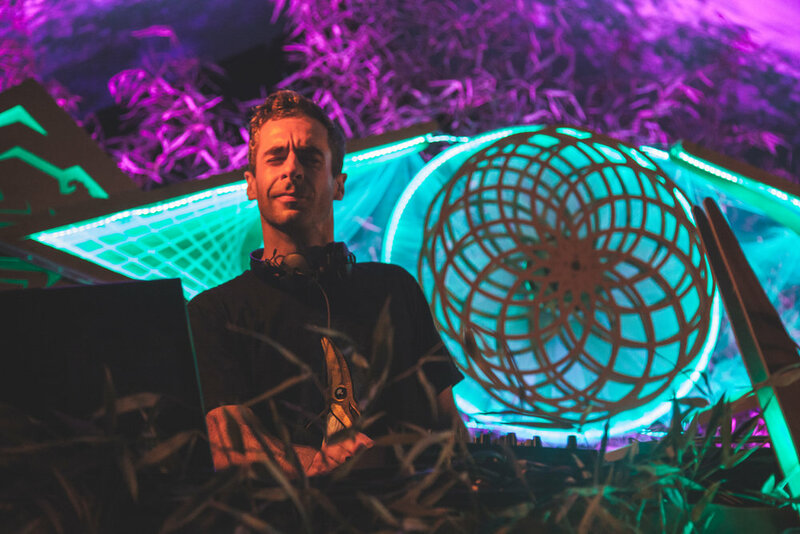 We didn’t quite have the numbers at the time that some people expect from a ‘successful’ festival, but right then and there I knew Solasta would be something special for all of us.” His voice betrayed his affection and high esteem for the operation. “First and foremost, the convergence of the crews working here. I’m glad we have the Rust crew down here, bringing your slice of the musical pie with you guys. The Harmonia team from Asheville is absolutely essential to the ethos of this place. As for Envisioned Arts, what Hasan and that team are building is just amazing.” He hits the mark without a fumbled word. Envisioned Arts and Harmonia indeed encompass nearly every aspect of integrated, patron-first musical experiences. (For more about these organizations, check out our past interview with their respective founders here). “The second thing that makes Solasta so inviting is the incredible level of intimacy that pours out of this little venue. You have one of the cleanest stretches of fresh water running right through the grounds. You’re nestled inside this gorgeous nook in the Appalachians. Once you’re out here, it just hits you square in your happy place. Furthermore, it’s especially appealing to me because it’s so specifically focused on the musical curation,” says Vince, who is himself a prime example of this curation. “For me as a performer, I sometimes struggle with the multiple-stage dynamic, wondering who and how many will show up to the time slot I’m given on the stage I’m placed at. Here, there is a single stage, with a top-tier sound system, ironically being operated by a DJ, who I suppose is DJing DJs (laughs).” His statement could not have been more on the money. As Vince finished regaling a love for Solasta shared equally by all in attendance, Hasan rounded the corner to grab him for some artist-to-manager business, bringing a succinct end to our conversation. I was left with the impression that we owe this man a thanks many aren’t aware of yet. Not only has he been a long-time player within our community, but he actively seeks to engage with it all these years down the road. From here out, all eyes are aimed straight ahead at Vince Santora and the Vinja project, as he’s sure to continue impressing the best and crushing the rest in his continued quest to energize the dance floor.